When the sick and marginalized are left behind, it’s Catholic health care providers who bring hope. 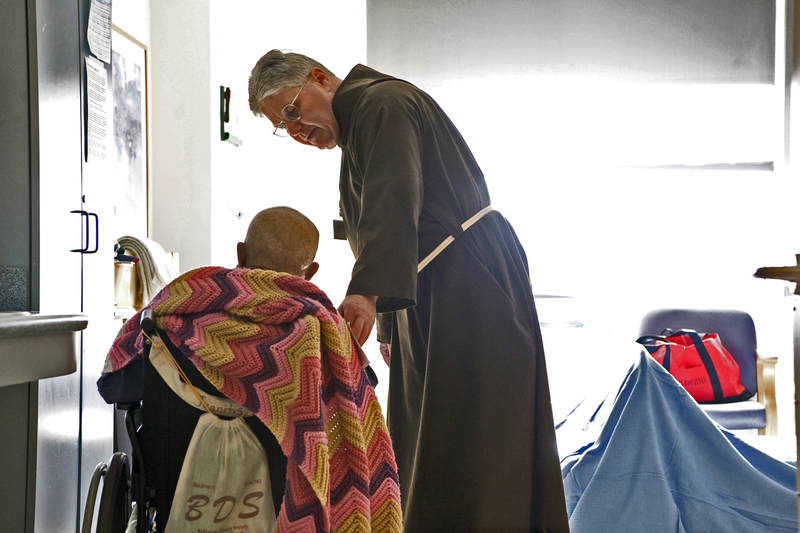 Pope Francis has urged the church to operate like a spiritual field hospital, reaching out to the peripheries where marginalized people struggle with their sorrows—ignored, forgotten and even resented by their more fortunate brothers and sisters. For many working in U.S. health care today, the pope’s field hospital is no metaphor; it is an everyday reality. Even as the Affordable Care Act has reduced the number of people who go without health care because of a lack of insurance—progress now threatened by the Republicans’ “repeal and reform” effort—millions in the United States still endure suboptimal health services, cut off by geography, income or social isolation from the services they desperately need. Longtime disparities persist along racial and income lines; rural residents can likewise expect to have fewer options for health care. But some marginalized communities arise out of the peculiar circumstances of American life. Undocumented people struggle to reach and afford care; some Native Americans avoid health services because they mistrust government or fear that they will not be treated with dignity; people returning to society from incarceration struggle to connect with the services they need. Here are a few ways a number of Catholic health providers are going to the margins to help. Dire economic and social conditions in West Baltimore came into national focus after the death of 25-year-old Freddie Gray while in police custody led to days of street disturbances in February 2015. The media attention revealed the depths of the area’s problems and inspired vows of community reinvestment from government and business leaders. But surveying West Baltimore a few years later, Dr. Samuel Ross says, “Unfortunately, not a lot has changed.” Mr. Ross is the chief executive officer of Bon Secours Baltimore Health System, a not-for-profit Catholic network sponsored by Bon Secours Ministries. He still sees neighborhoods full of uninhabitable rowhouses and abandoned storefronts—in a city struggling to overcome decades of industrial and manufacturing job losses. Poverty, a lack of job skills and inadequate shelter are threats to individual health. The traditional side of his job includes running an 88-bed acute care facility in the heart of West Baltimore, but Mr. Ross is also responsible for a surprisingly comprehensive network of community outreach programs. They include affordable housing, help with job skills and educational development, financial planning and parenting classes, and services for people who want help with behavioral and substance-abuse problems. Bon Secours, he says, takes a “holistic approach” to community health care. “What contributes to overall health, longevity, quality of life?” Mr. Ross asks. “Twenty percent of it is your parents, which you don’t control; 10 percent is access to health care; but 70 percent has to do with these social determinants.” By those standards, poverty, a lack of job skills and inadequate shelter are threats to individual health. Is it a coincidence that the Baltimore neighborhoods with the highest percentage of the city’s 16,000 vacant buildings also have the lowest life expectancy?“Health care institutions have to begin addressing health in nontraditional ways,” Mr. Ross argues. Surveying the range of social and economic problems in West Baltimore, Bon Secours administrators decided it was pointless to address individual pathologies without simultaneously treating the illness of the community around them. That is how Bon Secours administrators learned that the community’s primary concerns were not medical but instead had to do with “rats and trash and boarded-up houses.” Following up on those concerns, Bon Secours eventually developed and now manages more than 720 apartment units for low- and moderate-income seniors, families and people with disabilities. Bon Secours also runs a reintegration program for “returning citizens,” the preferred term for men and women coming back to the community after incarceration. Combating recidivism is a tough challenge anywhere, but it is particularly difficult for predominately African-American communities like West Baltimore. Decades of get-tough-on-crime initiatives have wreaked disproportionate damage on the African-American community; its young men and women have been jailed more often and for longer durations for comparable offenses than white Americans. The communities served by Bon Secours, says Mr. Ross, absorb the largest number of men and women returning to society from the Maryland corrections system. “We want to make sure that not just the [returning citizen], but the community itself has the best opportunity to grow and transform into a healthy environment for all individuals.” Without some kind of intervention as these men and women reintegrate into society, “what’s the likelihood of them succeeding?” Mr. Ross asks. The program assists about 200 people as they re-enter society, each person receiving an individualized assistance program that may include behavioral adaptation, substance abuse intervention, job training and parenting classes. With the right private and public support, Mr. Ross says, Bon Secours could help even more returning community members. Oil and agriculture are the driving industries in Kern County, Calif. And driving those industries are thousands of low-paid workers, including many who do not speak English and some who are in the United States without documentation. Poverty, language and never-ending paperwork can prove significant barriers to health care in the region. The economy provides jobs, but these jobs add petroleum emissions and pesticide residue to the county’s dry, dusty air. The city of Bakersfield’s unfortunate geography does not help. It is hemmed in on three sides by mountains on the southern edge of California’s San Joaquin Valley. Air quality here is by some estimates the worst in the nation, and incidences of heart and lung problems are among America’s highest. Asthma is also a significant problem for both children and adults in the county. Debbie Hull is the regional director of the Department of Special Needs for Dignity Health Mercy and Memorial Hospitals in Bakersfield. Beyond the Walls, a program sponsored by the Dignity network, stretches the definition of health care to cover a range of social service offerings, including homemaker services for elderly residents, community wellness programs, insurance enrollment initiatives and job training for parolees and other hard-to-employ individuals. Poverty, language and never-ending paperwork can prove significant barriers to health care in the region. Childhood obesity, and even diabetes, is one significant concern here. Beyond the Walls has responded with outreach workers who visit Spanish-speaking homes to offer nutritional and exercise counseling to parents. And when a dad is deported and the family faces sudden economic distress? The program offers emergency housing, food assistance, job counseling for remaining spouses, and school supplies and Christmas presents for the children. Getting health care to people working and living in Kern County who entered the United States without documentation is especially a challenge, but many native-born residents, unable to afford private insurance and unaware of what they may be eligible for, have similarly inadequate access to health care. “Many of them don’t know [what] is available to them, and they will wait until it’s an emergency situation and then they will go to the hospital E.R.s,” she says. That delay often guarantees a poor health outcome. Slumping oil prices have hit Kern County hard; thousands have lost their jobs or been forced into lower-paying positions. Heidi Horton’s husband, Jonathan, a welder, has been able to find only sporadic and lower-skilled employment since the downturn, yet he still made too much money for the entire family to qualify for the California Medical Assistance Program, though Medi-Cal would cover their children. For themselves the adult Hortons opted to hold their breath and hope for the best. In March their luck ran out. Mrs. Horton was diagnosed with a rare skin cancer. “I came home and cried for two days,” she says. The fear spread quickly. Her children, two teenagers and a 12-year-old, offered to look for work if that somehow might mean their mother could get treatment. She made the rounds of government agencies and doctors’ offices but with no luck. “Everything cost so much and no [private physicians] wanted to help because I was not insured,” Mrs. Horton said. But at a wellness clinic where her children went for check-ups, she was directed to some paperwork wizards on hand from Beyond the Wall’s Community Health Initiative. “I went over there thinking, ‘I’m just lost,’” she said. C.H.I.’s Cecilia Flores and co-workers went through her family and medical situation and quickly concluded that, contrary to past misunderstandings, the family was indeed eligible for Medi-Cal. Within a day Ms. Flores had expedited the insurance coverage, and that week Heidi Horton was signed up with an oncologist. She is now beginning a treatment program for her cancer. Just days earlier Heidi Horton had been considering a desperate plan to leave her family and live on the streets long enough to apply for assistance as a homeless person. Without Ms. Flores’s help, she says. “I don’t know what I would have done,” she says. “I’d probably be planning my funeral. Mrs. Horton can only wonder about other people in Kern County who may be in similar circumstances right now, confronting a serious illness and eligible for assistance but disconnected from the help they need to get it. It is terrible to contemplate that people could be foregoing treatment, even dying, because they could not wade through health insurance paperwork, she says. People living on the streets of Phoenix face a myriad of daily challenges, but over decades working with homeless people, one need consistently troubled Sister Adele O’Sullivan, a family physician and a Sister of St. Joseph of Carondelet: they had no place for healing. Homeless people recovering from illness or trauma were simply deposited in front of shelters, even “dropped off by taxi in their hospital gowns.” Shelter staff were in no way prepared to help them recuperate, and abandonment often meant that fragile and elderly people with life-threatening injuries or diseases were left to fend for themselves on the street—and even to die alone there. The respite care facility is one aspect of Circle the City’s comprehensive outreach for Maricopa County’s homeless residents. The program includes a number of different efforts not only to allow homeless people to access critically needed health services, but also to reconnect them with the community and its social service providers. For many homeless people, connecting with Circle the City can be the beginning of a transition from the streets to permanent housing. Reaching the homeless in a city as sprawling as Phoenix requires getting out to the sometimes out-of-the-way places where homeless people congregate. Circle the City staff will do so on foot, but it also manages a clinic on wheels with two exam rooms, to bring health services to those without shelter. Sister O’Sullivan hopes to piece together something approaching the continuity of care that people with shelter take for granted—that is, illnesses are diagnosed and treated with adequate recuperation periods and follow-up visits. This is no easy task under the circumstances, but she believes homeless people deserve the same quality of health care as anyone else. The work of Circle the City can be transformative, even lifesaving. Greg McOsker had been living on the streets of Phoenix for nearly a decade. Addicted to methamphetamine, he was gravely ill with a thyroid condition, living outdoors with “open wounds on my legs.” As his condition worsened, some friends took him to a local hospital, where he fell into a coma. His recollection of the next few days is spotty, but he remembers how Sister O’Sullivan “came out of nowhere” and transported him to Circle the City. He was not only able to recover at Circle the City, but the staff there got him placed into the transitional living apartment where he still lives. After returning to drug use months later, he stopped by the center to visit with Sister O’Sullivan. He found himself confessing his relapse. “I cannot lie to that woman,” he says, sheepishly. Mr. McOsker says he knows quite a few former homeless people who have been moved into permanent housing through this health intervention program. “The hospitals would kick us out and we’d still be sick or need wound care, and we had nowhere to go and we would just end up back in the hospital again. You didn’t have people to take care of you,” he says. “Between the hospitals and the streets, it’s Circle the City,” he concludes. The expansion of Medicaid sponsored by the Affordable Care Act has made a crucial difference in the progress Sister O’Sullivan has seen in patients like Mr. McOsker. She is horrified at the prospect of Obamacare being altered beyond recognition by the current Congress. She believes that the uninsured would return to a previous M.O.—putting off seeing a doctor until a crisis sends them to a hospital emergency room. “Many times when they wait for the E.R., they’ve waited too long,” she says. Treatable illnesses result in permanent damage; undetected cancers metastasize; without nutritional guidance childhood diabetes and obesity go unchecked. Because of the A.C.A., many of the homeless people Sister O’Sullivan works with now receive “specialty care, mental health care, diagnostic procedures and imaging—all of the things we have come to recognize” as standard care, she says. Homeless people have just as much right to these things as the housed, she argues. If only more American Catholics came and met with the people she encounters on the streets of Phoenix, she thinks, surely they would not be so hardhearted about expanding health care to all? “If only we could make the margins more permeable,” she says, certain that real solidarity is achingly close. This article also appeared in print, under the headline "Catholic health care providers bring hope to the margins," in the June 12, 2017 issue.